We meet on the 2nd Monday of each month generally for a 10.00am start and 12 noon finish but times vary depending upon the exact length of the walk. 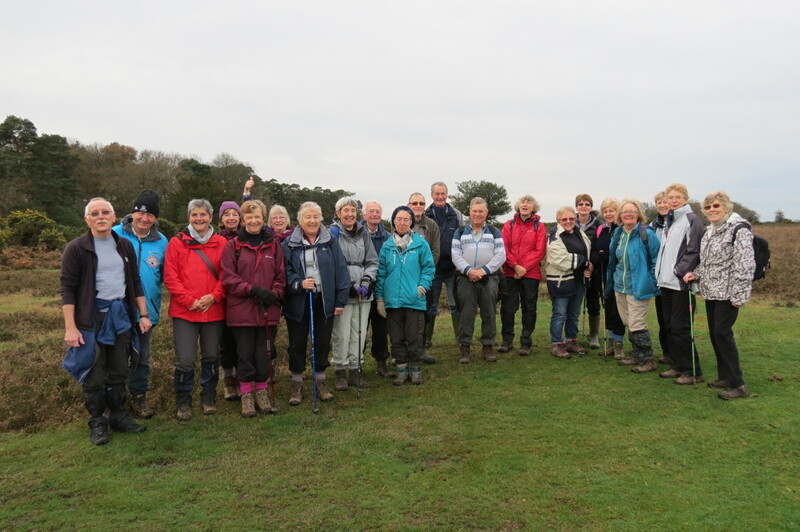 Members meet for a walk of about 5 miles in the neighbouring countryside around Fordingbridge and sometimes further afield. Members act as walk leaders to choose and lead the walks using footpaths in the area. The walk concludes with an optional lunch, usually at a pub. Members are encouraged to share lifts. Walkers need to have appropriate clothing and footwear. Paths can be muddy at all times of the year. 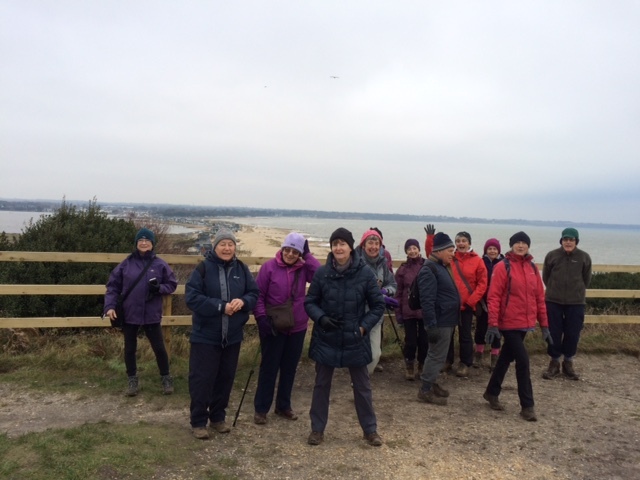 January: We started the year with a walk from Wick to Hengistbury Head, led by Nora. We began with an easy walk along the river and across some fields. As the tide was out we were able to walk along the foreshore before returning over the Head. We were pleased to have a coffee and snack stop at the café before returning to the car park. 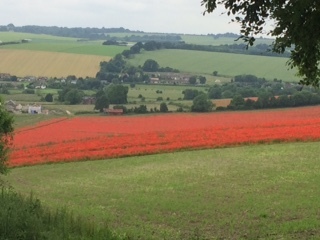 We enjoyed walks from Brockenhurst, Martin Down, Hamptworth, Tarrant Gunville, Sherfield English, and Damerham. Our final walk of the year started from Minstead on a very cold day in sleet. However, Derek and Alison, who were leading the walk, suggested a way of shortening it. By the time we had walked a few minutes we were warmer and the weather had relented. Towards the end of the walk we visited Minstead Churchyard and stopped by the grave of Conan Doyle. We learnt a little of the strange history of his burial – almost as mysterious as his stories! Derek and Alison provided mulled wine, mince pies and gingerbread and we were soon feeling comfortably warm. 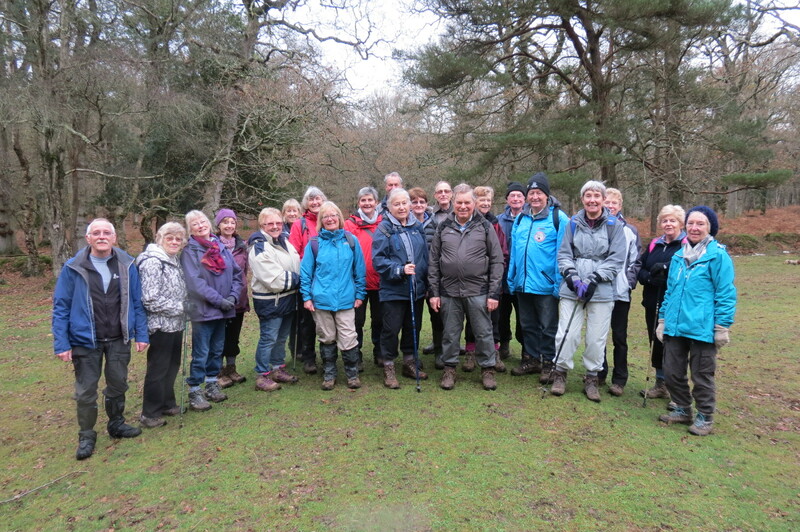 Chris and Ian organised a most enjoyable walk from White Sheet Hill car park, Holt Heath. The route took us along narrow lanes to enter Holt Wood, a nature reserve. On leaving the wood we crossed Holt Heath with its views of the surrounding countryside. Holt Heath is also a site of special scientific interest owned by the National Trust. we were lucky enough to spot a couple of deer, albeit fleetingly! A very good pace was set and we rounded the morning off with lunch at the Cross Keys Inn. This walk, led by John and Judith, set off at a cracking pace from Acres Down car park. Fortunately the sun had been shining and the thick mud which had been expected had at least dried up. the walk took us across the open forest and up onto the ridge overlooking the A31 in the distance. When we got to the brook we were surprised there were no log bridges to clamber over so we skirted round the edge and found a footbridge to cross instead! The route took us through Highland water enclosure and back through the woodland. John Gilbert spotted a few tree creepers on our arrival and Alan took photos of poo to identify on his return home! 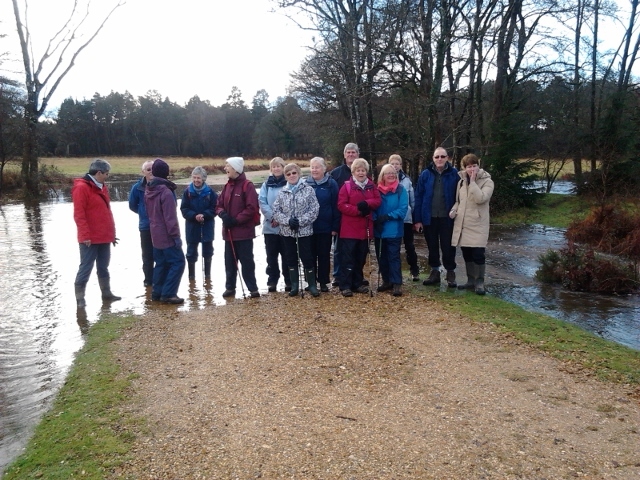 In March our walk, led by Susan, was an easy level walk around Sopley and Ripley, with only a little mud to contend with. The sun was out and there were plenty of signs of Spring in the flowers and wildlife, and some unusual domestic birds which we think were rheas. This walk took us through Stanpit Nature Reserve and SSSI. We began with a short walk to the Visitor Centre where a warden gave us a short talk on the Reserve. She warned us that we may not be able to go the way we intended as there was an unusually high tide (even higher than the day before when Nora had tested it). Luckily Nora knew the area well and was able to guide us on an alternative where we were led on pathways through the quay and around Christchurch finding corners we didn’t know existed. Our January walk was closer to home, starting from Frogham. We began by climbing to Hampton Ridge and enjoying the views on each side, then down to Pitts Wood. There was one stream to negotiate, and some mud to pick our way through, before we took footpaths back to the top of Blissford Hill. January - where's the small stream gone? December walk after the mulled wine!